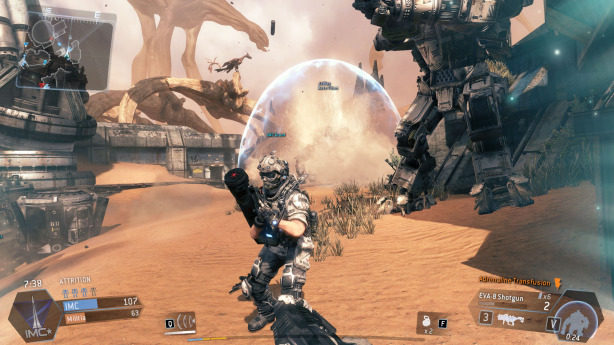 Titanfall crams more action into ten minutes than most games do in ten hours. 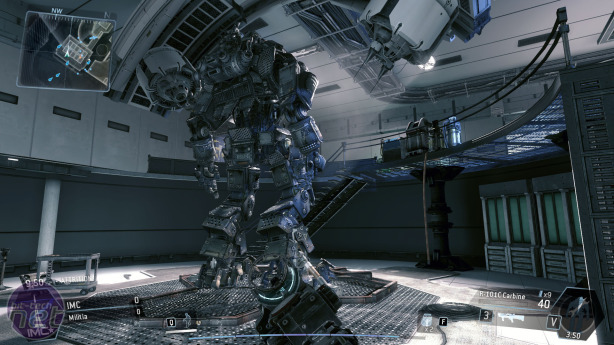 There's plenty to like about Respawn Entertainment's first attempt to revolutionise the multiplayer FPS, but what is perhaps most admirable is how mindful Titanfall is of the commitment it asks of you. This is a game which slots into a lunchtime like a lightning port into an Apple device. And not a second of your attention on the game is wasted. Even during the ninety-second breaks between matches, you're tinkering with your custom pilot and Titan classes, and debating which of the game's brilliant Burn Cards to carry with you into the next round. In a genre which has failed to get better for years, and so has opted to get bigger instead, Titanfall is a reinvigorating antidote to the bloated bombast of Battlefield. It is lean, svelte, fit and fast. It's also brimming with ideas of varying sizes, and when it comes down to it, is simply enormous fun to play. But it also doesn't quite deliver on all of its revolutionary promises, and neglects to include some pretty basic features anyone would expect in a PC multiplayer game. Titanfall's strive for innovation is clear from the off, through the presence of a campaign mode in an entirely multiplayer game. This campaign uses nine of Titanfall's fifteen maps to tell the story of an intergalactic war between the GOOD rebel Militia and the EVIL IMC. It's easy to tell who is good and evil because the Militia have American accents whereas the IMC have British and South African accents, and everyone knows that British and South African people are all horrible bastards who eat live kittens for breakfast and grow moustaches for the specific purpose of twirling them, the monsters. The story is told through brief cut-scenes at the beginning of each mission, and a small dialogue window in the top-right of the screen that explains the goings on during missions. Frankly, it's total rubbish; abysmally written bilge that somehow manages to make a straightforward war between two factions seem labyrinthine in its complexity through extended references to characters you hardly spent any time with, and endless plot contrivances designed so that the story remains the same regardless of the outcome of the players' battle. The multiplayer campaign is Titanfall's biggest disappointment. Fortunately, the speedy nature of the game's matches means it is also short. You can play through both sides of the campaign in under four hours, which unlocks two additional Titan Chassis' for you to use. The tale is also told in such a way that you can largely ignore it, and focus on the far more interesting personal story of your giant gun-toting robot versus everyone else's giant gun-toting robots. Before we get to the main event, it's worth pointing out that even without its eponymous mechs, Titanfall would still be a highly enjoyable FPS. This is thanks to the wonderful acrobatics of the Pilots. 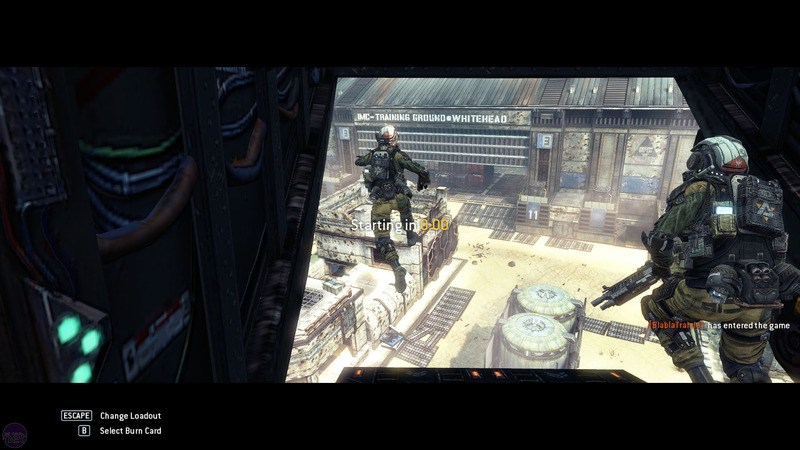 The combination of wall-running and double-jumping is transformative, making Titanfall a truly three-dimensional shooter. It also proves a somewhat lateral solution to the problem of bunny-hoppers spoiling the feel of the game. Now that feels like a perfectly natural evasion tactic, as does pinging off the walls like a pinball and leaping through a second-floor window before dashing around the corner to clip your opponent as they gleefully follow you in.